The identity of “The Alpha and the Omega” of the book of Revelation is quite often the source of debate, and this is usually between those who subscribe to the doctrine of the trinity versus those who believe what the Bible teaches, namely, that the Almighty God of the Bible and his son, Jesus Christ, are in fact, two separate individuals. The fact that Jesus Christ is the second highest ranking individual, and not the Most High God, is clearly depicted in the vision of Revelation. 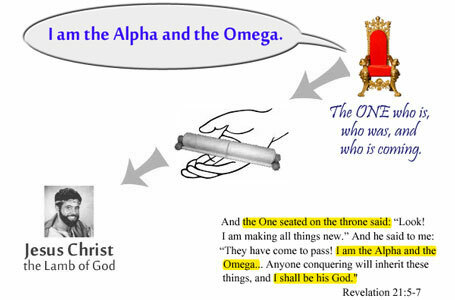 Within John’s vision, there is a unique title that is used, “The Alpha and the Omega”, and the purpose of this article is to take a simple approach at identifying who that title belongs to. 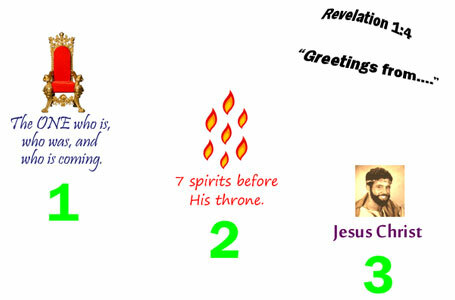 Right away we learn in Revelation 1:4-5 that “The One who is and who was and who is coming” sits upon a throne. This will be significant as we move along. So did you catch that? Of the three characters we have just been introduced to, which of them has told us upfront and right away that HE is the Alpha and the Omega? Yes, it was “The One who is and who was and who is coming”. So the Most High God, Jehovah, identifies himself as the Alpha and the Omega, and not the other 3 characters who are on the scene at this point. This title harmonizes with other titles he uses in this same sentence. “The One who is and who was and who is coming” should bring to mind his being eternal, with no end and no beginning, which is only true of Jehovah because all other things, including Jesus, had a beginning (Psalm 90:2, Proverbs 8:22, Micah 5:2, Colossians 1:15, Revelation 3:14). 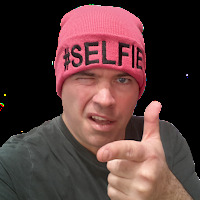 Now, characters in a book are constant features. Once their identities are established, we know who they are and when they are speaking throughout the rest of the story. Likewise, at these point, this characters identity has been clearly established, and we could be satisfied at this point as we read along the rest of this vision of John. But in harmony with the principle “that at the mouth of two or three witnesses every matter may be established”, let’s try to confirm the identity of the Alpha and the Omega again in the next instance it occurs (Matthew 18:16). After addresses some congregations in the first 3 chapters, the vision moves into the heavens in chapter four. There we see the throne again, and the one seated on it is “The One who is and who was and who is coming”, whom we have already learned to be the Almighty God, Jehovah, the Father. 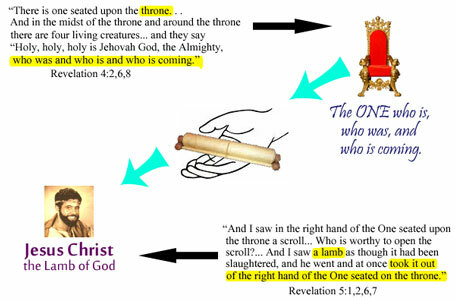 He is holding a scroll in His right hand and the question arises “Who can open it?” The answer is “The Lion of the tribe of Judah”, and “The Lamb of God” which are both titles of Jesus Christ. Jesus is not “The One who is and who was and who is coming” and is not the one seated on the throne. 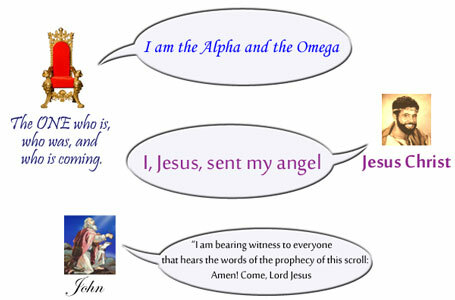 Jesus approaches the one who earlier identified himself as the Alpha and the Omega and takes the scroll from His hand. 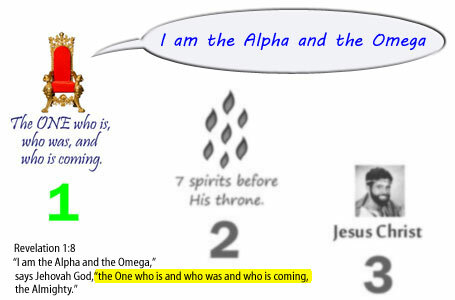 Did you notice who identified Himself again as “The Alpha and the Omega”? Yes, it was the “One seated on the throne” and not Jesus Christ. Also significant in this verse is that He says “I shall be his God, and he will be my son”. While God often refers to individuals as his sons, Jesus never refers to others as his ‘sons’ but rather as his ‘brothers’. So, we have these characters in John’s vision, in Revelation, who have been clearly identified for us. On the one hand, we have the Almighty God who refers to himself as the Alpha and the Omega, and on the other hand, we have Jesus Christ, who has been in his presence each time and has said nothing to the contrary. So, who is speaking here? Well, it is none other than the Alpha and the Omega! We learned who this was in chapter one, and his identity has been made clear throughout the vision. This is the Almighty God, Jehovah. But does Jesus speaking here mean that he was also speaking the words right before? No. Not at all. Jesus is clearly identifying himself in verse 16, just as the Alpha and the Omega had identified Himself in the preceeding statements as well as on two other occasions in the book of Revelation. In this last chapter, several people are speaking, 1) the Angel, 2) the Alpha and the Omega, 3) Jesus, and 4) John. Lastly, does it make sense that this person’s identity, which was clearly established at the beginning of this book and throughout, suddenly become clouded at the end of the book in it’s very last chapter, in it’s epilogue after the vision has been given and the story already told? Of course not. Put yourself in John’s position. When John received that vision, he could clearly see with his own eyes “the One who is and who was and who is coming” sitting on his throne and twice calling himself the Alpha and the Omega, and he could also clearly see that Jesus Christ was a separate individual in the vision who did not call himself by such a title, but rather received a scroll, direction, and orders from the one calling Himself the Alpha and the Omega. So at the end of this vision, when the angel relays this persons words who says for a third time that he is the Alpha and the Omega, doesn’t John already know by now who this person is? Would John really wonder at this point who is speaking? No he would not! Rather than inserting interpretations or preconceived ideas into any Bible text, we are wise to simply read what it actually says. Granted, there are certain elements of the vision of Revelation that can be quite challenging to figure out on one’s own. However, the identity of “the Alpha and the Omega” is not one of them, and is abundantly clear that only the Almighty God, the Father, ever refers to Himself with such a title. Five Guys Burgers and Fries Wants Your Soul! You’re right! If they would just leave the name Jehovah where it belongs, instead of tampering with the scriptures and removing his name and replacing it with LORD, a lot of misunderstanding could be avoided.